The Depression quilt block was likely created during the time known as the 'Great Depression' in the 20th century. Therefore, it seems likely that this block was made using the quilter's scrap fabric stash. So, the sample block is made in that fashion, using a variety of both lights and dark fabrics. This is an easy four patch quilt block to make since the only patch used is the half square triangle. Once you master making those, it is simply a matter of the arrangement of the patches to create the block. 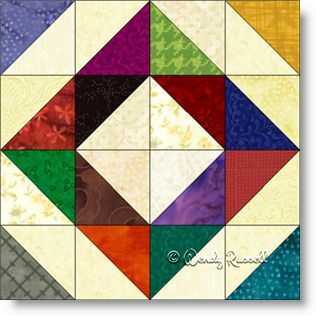 All sorts of different quilts can be designed using this one quilt block. By laying the blocks in a straight set or on point, the creativity is endless.